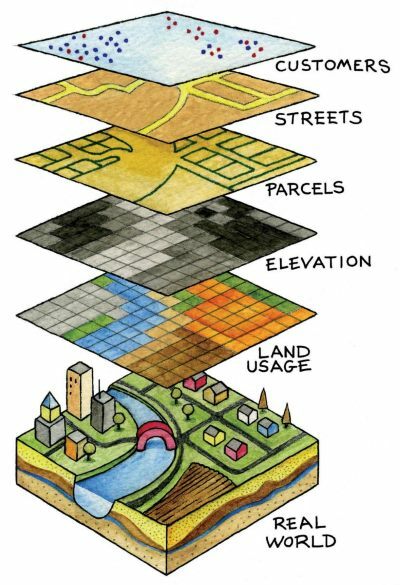 GIS (Geographic Information Systems) is a system of computer software, hardware and data to help manipulate, analyze and present information that is tied to a specific place on earth. GIS combines layers of information about a place to give you a better understanding of that place. What layers of information you combine depends on your purpose. For example, GIS can be used to help reach a decision about the location of new paving projects based on a number of factors such as rating of current pavement, condition of underground infrastructure, condition of sidewalks, street use, and much more. The information can be presented accurately and clearly in the form of a map and accompanying report, allowing decision makers to focus on the real issues rather than trying to understand the data. Because GIS products can be produced quickly, multiple scenarios can be evaluated efficiently and effectively.